Cherokee County, GA reaches 8,000 users on the CityView Portal! We couldn’t be more proud to announce that Cherokee County, GA has just passed 8,000 active users on the CityView Portal. On Saturday, February 9, 2019 at 8:16:59 am a Cherokee county home owner became the 8,000th user when he registered with the CityView portal to check on his basement finish permit. Cherokee County is adding 4.5 active users per days, 7 days a week. They expect to pass over 9,000 active users on September 2019 and over 10,000 users in April 2020. 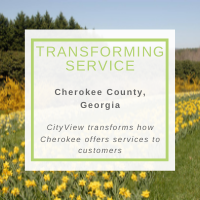 “CityView and the CityView Portal is working very well for Cherokee County,” said Kevin Cully, Information Technology – Senior Business Analyst / Data Manager. The CityView Portal provides the ability to initiate code cases, apply for permits, request meetings and inspections, view public information, subscribe to activity in jurisdictions of interest, and more.